Online shopping has transformed retail, for good. For many consumers, an online shop is the very first stop in their purchase journey before even setting foot in a brick-and-mortar store. Forrester research figures show 2014 holiday e-commerce sales broke upward of $130b in U.S. and European markets. Online sales are forecasted to grow 61 percent by 2018, and as technology continues to foster innovation in customer service (mobile free shipping, same-day shipping, tracking, etc. ), consumers will continue to join the digital wave. Consumers value online shopping for two main features: easy access to unique products and a customized shopping experience. Online shops that offer these features tend to be standouts for shoppers looking for that special item, with the best value and the least hassle. For inspiration, check out these online shops for the best the Web has to offer in unique products and online shopping experience. High-end fashion junkies have to wait months on end for new collections from their favorite designers. Runway shows, publicity events and press drive the hype, but why wait until the next Fashion Week to plan your killer closet for next season when you can create your own designer fashions with Tinker Tailor? 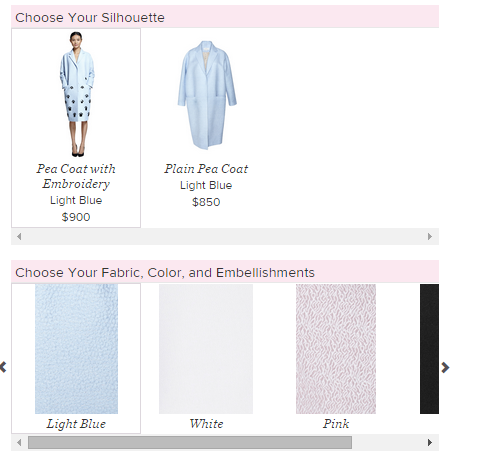 Users can customize their luxury pieces by fabric and color depending on the product and access a wide spectrum of statement coats, dresses and accessories. Your office, whether at home or work, can easily become dry and gloomy. Gray walls in the office building and colorless notebooks at home can make work a lot more draining. Art Markit deals imaginative decor, inspired and produced by artists around the globe, welcoming users with one-of-a-kind accessories for both home and office and a marketplace for artists looking grow their brands. Merchants may be inspired by its philanthropic angle - donating a portion of each sale to a cultural organization. Hypermarkets like Walmart and Target are big hits with consumers because they can leave the store with big, bulging bags and wallets to match. Overstock.com possesses the same qualities as the big name retailers, super low prices and and products for every aspect of your daily routine, all without leaving the house. Merchants should know that Overstock's everyday free shipping with purchases over $50 is one that consumers are coming to expect, as its rewards program. As more consumers move online, even more are making purchases from their smart devices. Luxury online fashion retailer Net-A-Porter, and its menswear counterpart Mr. Porter, have led mobile retail innovation with their unique mobile shopping suites. 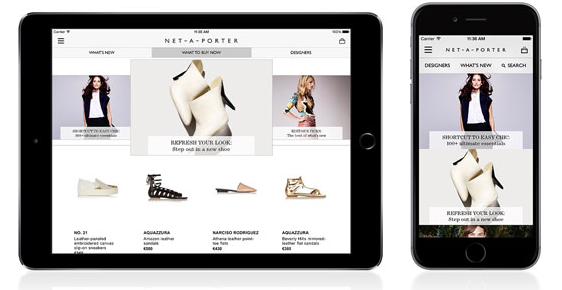 Net-A-Porter and Mr. Porter apps features both a well designed user experience and interface functions as both a digital boutique and fashion editorial. Users can access original content that seasonal fashion tips from industry experts, exclusive interviews with designers and interactive sizing charts — always handy when a dressing room isn’t present. For merchants, this could reduce the amount of returns they receive. Streetwear culture has redefined fashion. Subway fashions from the American underground have made their way to Paris and Milan, and streetwear brands have begun incorporating luxury attributes into their designs. ShopSuperStreet captures the crossover between luxury and streetwear featuring brands like Moscino and Raf Simons, offering an inventory of colorful, comfortable pieces for the chicks with hipster chic - proving success is to be had for merchants keeping an ear to the digital ground. What's more, its Instagram presence is one to watch, as it pairs products together to inspire conversions and gives followers behind-the-scenes looks at its brand. Virgil Abloh is a Chicago-based, luxury streetwear designer and Kanye West’s creative director. 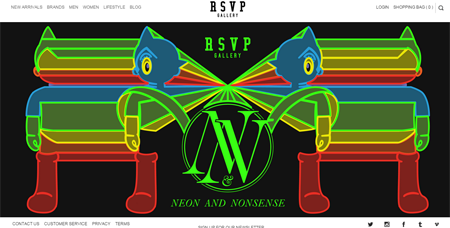 His boutique, RSVP Gallery, highlights the most exclusive brands in streetwear and the online shop is a hub for one-of-one releases like designer sneakers and collaborative pieces. Its success is proof not only that exclusivity sells in retail, but also knowing your audience does (its Web design is surely a testament of that). Dylan Chadwick is a content writer at Fueled, the leading iPhone app builder in New York City, renowned for its award winning mobile design and strategy.